Many fiddle tunes played at dances and sessions go by the title “Don’t know the name of that one” or simply “Unknown.” The Irish-language equivalent is the familiar “Gan Ainm,” meaning “without name.” But many tunes do have names that are known and recognized wherever musicians gather to play. In Part I, let’s look at some familiar tune titles that conjure up visions of past events and historic figures. The USS Constitution sailed from Boston, Massachusetts, on August 2, 1812, bound for a raiding cruise off Nova Scotia, the Gulf of St. Lawrence, and Newfoundland. Commanding Officer Isaac Hull’s mission was to find and engage any active Royal Navy frigates. 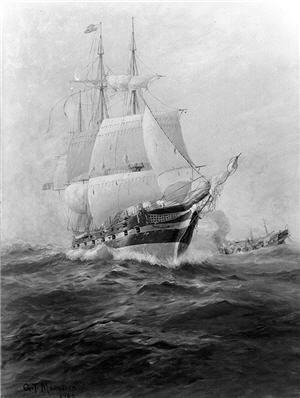 On the afternoon of August 18, some 400 miles southeast of the British base at Halifax, a sail was sighted that turned out to be HMS Guerriere and a battle commenced the next day. This famous sea battle – a shocking win for the fledgling American Navy – was commemorated by a hornpipe called “Hull’s Victory,” one of the classic old-time New England fiddle tunes with a matching contra dance. The “Constitution Hornpipe” also commemorates Old Ironsides. “Road to Boston,” the omni-present dance tune, was originally a fifer’s march popular during the Revolutionary War. Extensive research has yet to uncover exactly which route the musician or dancer, while engaged with this tune, is transiting to The Hub. Could it be the Boston Post Road from the north, I-95 from the south, or Route 2, the old Mohawk Trail, from the west? Many contra dance evenings are rounded off with a polka for couples and a popular tune choice has always been the “Jenny Lind Polka.” The tune originated in 1845 as a composition of Anton Wallerstein titled “Jenny Lind’s Lieblings-Polka.” Jenny Lind (1820-1887) was a world-reknown operatic singer born in Sweden. She began singing on stage at the age of ten, and by the age of 17 was a favorite in the Royal Swedish Opera. Soon she became a member of the Swedish Royal Academy and court singer to the King of Sweden and Norway, and later toured throughout Europe, visiting England for the first time in 1847. As a result of her triumphal tour of the United States, Canada, and Cuba in 1850-1852, Lind earned a considerable fortune due to her association with showman P.T. Barnum, who agreed to pay her $1,000 per performance (plus expenses). The 93 concerts she gave for Barnum helped launch Lind’s other career as a philanthropist. Playing the “Jenny Lind Polka” not only provides lively dance music, it also honors the “Swedish Nightingale,” one of the most cherished singers of the 19th century. Randy Miller is a fiddler, pianist, music teacher, and tunebook publisher active in contra dancing since the 1970s. His contradance band, Celticladda, was formed in 2006 and performs nationwide. Randy’s website is www.fiddlecasebooks.com. Painting by G.T. Margeson, 1906, depicting Constitution sailing past the dismasted Guerriere. Photo # USN-1055208. 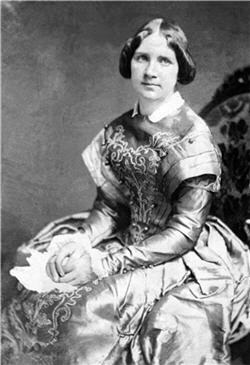 Daguerrotype of Jenny Lind at age 29, taken in New York City two weeks after her arrival in America on September 1, 1850. Original Daguerrotype DAG 509X is in the Library of Congress. I never knew the origin of the “victory” in Hull’s Victory. Thanks. Well, wouldn’t you know, I “Googled” for the origins of the Jenny Lind polka and found the answer right here in my own back yard! It’s a small world. I also got here by “Googling” the Jenny Lind Polka- and although I live south of Baltimore, this is my “back yard” in that I play music for contra dances. Could someone lead me to an online copy of sheet music for “Jenny Lind’s Lieblings-Polka”? I tried the L.O.C. site- found a bunch of J.L. “knockoffs” (e.g. a 2-part version arranged for cornet band), but nor the original.